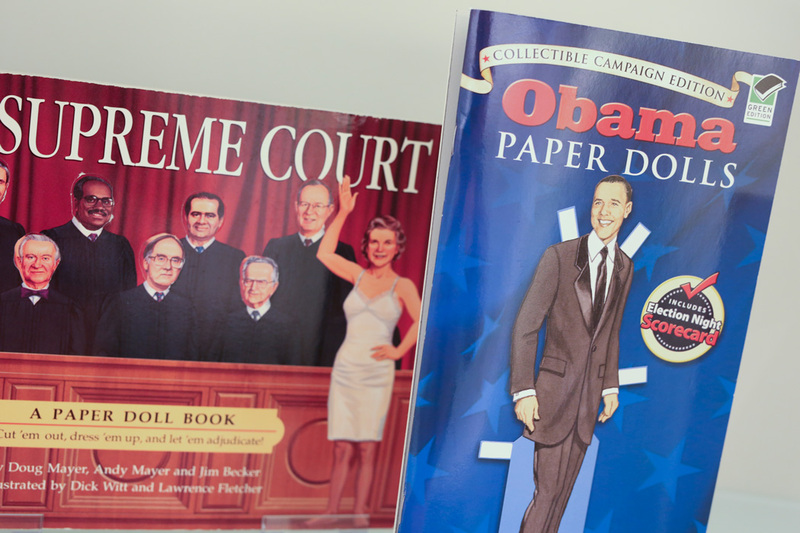 The Civil Rights movement was instrumental in the move away from destructive stereotypes toward positive images based on real people, like this “Obama” paper doll. Photo by Jim Barcus, image from the collection of Arabella Grayson. “Topsey,” based on the Topsy slave character in Harriet Beecher Stowe’s Uncle Tom’s Cabin, was one of the earliest black paper dolls. Photo by Jim Barcus, image from the collection of Arabella Grayson. Arabella Grayson with “Petunia” (1937), one of the black paper dolls from her collection on view at the National Museum of Toys and Miniatures. Photo by Jim Barcus, image from the collection of Arabella Grayson. 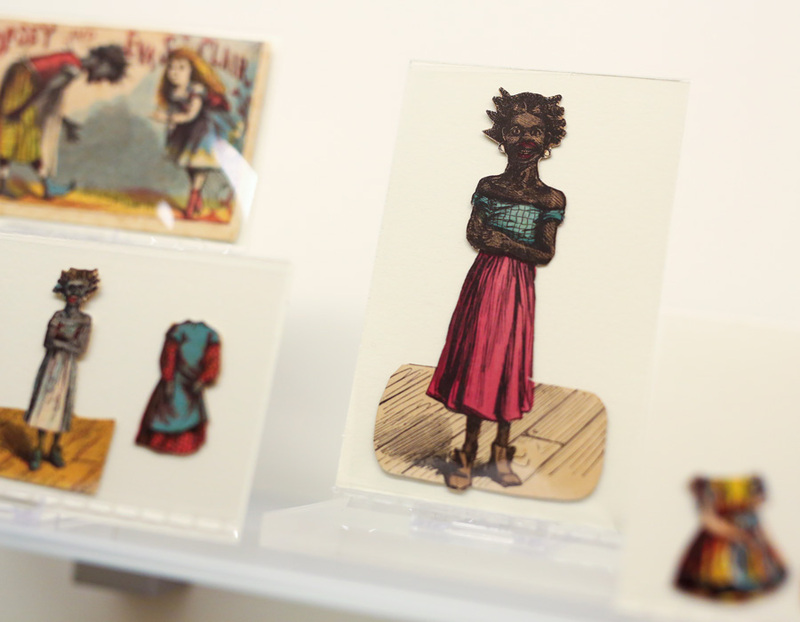 Exhibit examines racial messages of black paper dolls from the Civil War era to the present. To make a paper doll you need paper, utensils used for drawing and/or coloring, an imagination, and illustrated clothing for the doll. Now, go back 150 years and make that paper doll black. To the previous list of materials, add a hidden agenda, hatred and cruelty toward a certain people, and a narrow definition of beauty. That black paper doll, whether it depicts a mammy figure or a tribal savage, will permeate the perceptions of American society for decades to come. Drawn from the private collection of Arabella Grayson, the exhibit is organized into four sections: Civil War, Jim Crow and Topsey (1860-1899); Mammies, Minstrels and Mass Production (1900-1939); Civil Rights and Changing Attitudes (1940 – 1969) and Modern Paper Dolls (1970-present). Taken together, they document a progression from early dolls that promulgated racial stereotypes to dolls with positive themes such as “Black is Beautiful” and dolls based on eminent African Americans such as President Barack Obama and First Lady Michelle Obama. Grayson has been actively collecting black paper dolls since the early 2000s, after one of her friends gave her a Caribbean doll as a gift. Grayson received the Caribbean doll in a birthday card from her friend, and from the moment it arrived, she said, it provoked questions and a search for answers. One of the earliest black paper dolls is “Topsey,” based on the slave character, Topsy, from Uncle Tom’s Cabin by Harriet Beecher Stowe. Created in 1885 by McLoughlin Brothers (which added an “e” to the name), for an audience of Caucasian children, the Topsey doll wears a tattered blouse and skirt with untied brown boots. Her skin is dark brown, her eyes are squinted, her lips are big and red, and her hair is unkempt. And then there was Miss Malinda Pickaninny (1909) who also has dark brown skin, but unlike Topsey, her hair is styled in multiple pigtails. Miss Malinda’s clothes aren’t as tattered, but of course they are not as extravagant as the costumes of her white counterparts. This doesn’t sound bad, until one dissects the word pickaninny. According to the Merriam-Webster Dictionary, this word offensively refers to a black child. So while Miss Malinda didn’t look as ragged as Topsey, she was given an offensive name that perpetuated negative stereotypes of black children. Negative stereotypes extended to depictions of African-American males. Take the doll “Smokey” for instance, created in 1932 and circulated throughout the United States. He came with two outfits befitting his occupation as a butler. Like Topsey, Smokey has exaggerated features such as big lips and large feet. And then there is the Little Black Sambo paper doll, part of a foldaway kit that included a stage for him to perform on. Sambo’s body features were distorted to look more “tribal,” to fit his storyline of living in the jungle. Themes such as these took these black paper dolls from being playful characters to destructive caricatures. These images, once circulated around the world, are barely heard of today. Grayson’s collection has been exhibited at multiple venues, from Mills College to the Smithsonian in Washington, D.C. She remembers the first exhibit at her alma mater, Mills College, and how the attendees were very silent and shocked by the content, a reaction Grayson completely understands. Somehow, the positive images that also appear in this exhibit can’t dispel the horror of those early dolls. 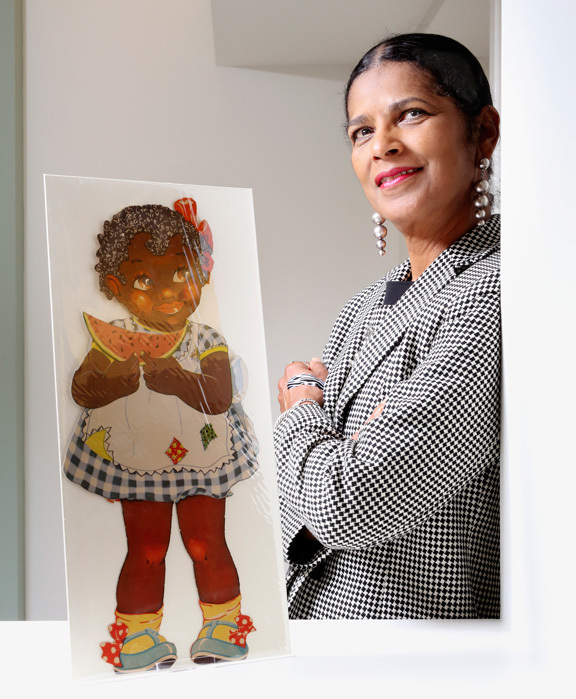 The exhibit provides a powerful reminder that racism is a learned behavior, and that a simple activity, such as playing with a paper doll, can instill ideas that cloud the destiny of generations. “Stereotypes to Civil Rights: Black Paper Dolls in America” continues at The National Museum of Toys and Miniatures, 5235 Oak St., through August 21. Hours are 10 a.m. to 4 p.m., Monday, Wednesday, Thursday, Friday, Saturday, Sunday. Admission is $5 for ages five and up. Free to children age four and under. For more information, call 816-235-8000 or visit toyandminiaturemuseum.org. KC Studio and KCPT have teamed up to cover the arts more fully. This article also appears in KCPT’s digital magazine Flatland, a destination for local and regional storytelling.